The canal and towpath looking backward towards Cumberland. The canal was on our left almost the entire distance to the tidewater. Day 4 we began the long trek to the coast, or at least to the Chesapeake. The route is almost perfectly level. It runs along a canal, the “towpath” that mules used to pull canal boats–mostly loaded with Allegheny coal–to the coast. Seventy or eighty locks lower the level of the canal along the way, each providing about a ten-foot drop for bikes to glide down. The canal was doomed almost from the moment the first shovel began digging the Grand Old Ditch in 1828. The Baltimore & Ohio railroad, B&O of Monopoly fame, began construction about the same time, and beat the canal to Cumberland by eight years. But from 1850 to the mid-1870s, freight on the canal was still cheaper than on the rails, and the canal didn’t close entirely until 1924. The trees on the left are growing in the canal bed. Now it’s a relic. This whole bike trip is a relic of a past civilization. In most places, there’s no water. Trees have filled in the canal. Some parts are black water ponds or sinks. The locks are mostly in clearings where park rangers keep back the trees, but earth has filled up most of them and grass has grown over. The stone walls in the picture below go ten feet deep into the earth. Or, rather, the earth has filled up to that height. Once this lock was full of water and carried canal boats. You can almost hear the voices of the men operating the big wooden doors, and you can almost picture the locks full of water and the long canal boats and people shouting and the smell of heaps of coal and mules steaming in the morning cold. But you can’t quite. The earth has covered them up. The stone’s silent. The lives are gone. These stone walls are buried to a depth of about fifteen feet. A hundred years ago and filled with water, they’d raise and lower canal boats. Robert Browning once looked at a scene like this–in Italy somewhere–and wrote his famous poem, “Love Among the Ruins.” Old stone turrets, the towers of a once-fabulous city, poke out of the undulating sea of grass. Sheep meander the stones chomping vegetation. Time has over-rooted the high city walls. Song birds nest in the chinks between stone. Where princes once roistered, a poor shepherd awaits his lover. The reader must choose between the opulence and grandeur of that long-gone city and the simplicity of the peasant lovers. There’s no mistaking that Browning prefers the lovers. But what if no great man ever belonged to those stones in the first place? What if those stones marked the lives of ordinary, humble people whose names we don’t remember? No one’s going to forget Andrew Carnegie. But what about the people who worked those coke ovens along the Youghiogheny? The Irish and German immigrants who dug the C&O, the masons who set the stones? Their remains are the anonymous ruins. Some of the locks are in parks along the Potomac, and there you see children running over the grass. But most are deep in the woods, seen only by bikers and the occasional naturalist on foot. You ponder big questions as the miles pile up. Meaning of life questions. Meaning of death. Look closely to find the telephone pole. 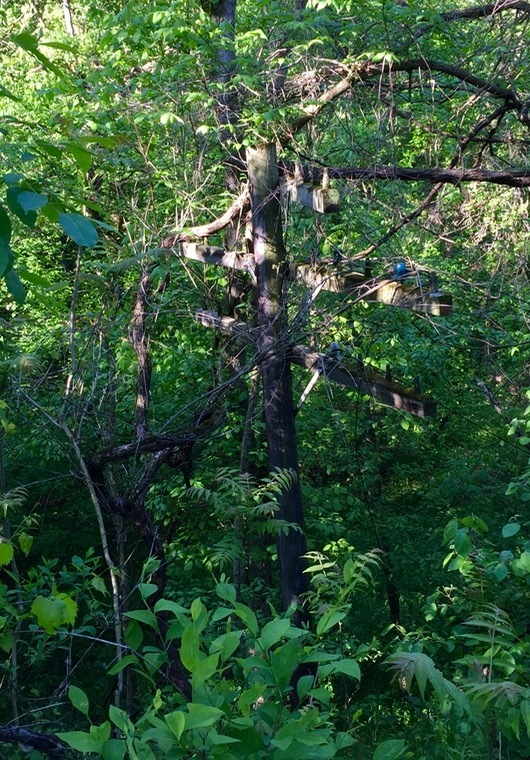 Old telephone poles ran along some sections of the railroad bed, the old Pittsburgh and Lake Erie line, like crucifixes. The poles are regular telephone-pole height, but their cross-trees are about eye-level or even lower, because the rail bed is raised. The arms of the poles stretch out but hold nothing. Once they carried conversations back and forth across the distances, but not today. Ruins. Trees have grown up so thick that it seems the poles must have been abandoned a hundred years ago. But we’re not talking about ancient history. On Day 3, I asked the genial man at the Meyersdale train-station museum, “When did the trains stop running?” I thought he’d say something like 1880. I was 13 years old. Conseula, who died a week ago, was two years old when the freight trains stopped running. Already, nature has reclaimed the telephone poles. Forests are growing up around our own past. I wonder what will be my own remains. That’s part of why people write. Certainly why I write. Sheer egoism, George Orwell called it, in one of his many moments of clear thinking and frank talking. To erect our own stone locks that will stand up against the forest. Though I doubt any children will play on the moss that grows over my books. It sounds morbid, and Day 4 is dull and plodding. It’s sixty miles to Hancock, and the towpath is slow going. Much harder than any section of the Allegheny, even if it is flat. The rain from Day 3 has left the track muddy and rutted. In some places, we’re barely managing six miles per hour. It’s a slog. Always staring at the ground to maneuver around the muddy sections or to pedal through the unavoidable puddle. Carrying on their shoulders all the weight of our luggage, our back wheels fish-tail in the soft earth, and you have to muscle the peddle one more hard revolution to keep from tipping over, to slog up out of the mud. We don’t often lift our eyes to look around, having to attend all the time to the next hole in the path or mud puddle. But we’re confronted by beauty when we do. Occasionally, when the canal runs along the Potomac and when the trees part, you can glimpse some of the rugged beauty of that river, rocky bluffs across the way, or low rapids singing. The current is swift and powerful, like if you fell in you’d be carried downstream faster than we’re pedaling. Mostly, you’re riding through a tree tunnel, and on your left hand side is a ditch, sometimes lined with stone but generally just a depression in the earth, a boggy section lower than the towpath and the steep-rising hills just beyond. The trees grow everywhere, in canal bed, up the slope, between the towpath and the river. Infrequently, the trees part and in a sunny spot wildflowers grow along the margin of the path. Once, there’s a real tunnel, a passage through a mountain more than half a mile long. We had to walk our bikes. The ground was uneven, narrow, and it was very dark. The bright light at the tunnel’s end doesn’t light anything–it just blinds you more to the invisible ground beneath your feet. I thought I heard bats. I stopped to listen. Nothing. I started walking again. It was my own bike squeaking. Day 4 is the toughest yet, mentally and physically. We’re near exhaustion at lunch. We depart the path to ride across the river into Paw Paw, West Virginia, where we find a café open on a Sunday. The food is indifferent, the dining room is lined in cheap paneling, but the family who owns the place is friendly and the only other table with people–two old women and an old man–are full of good will. We listen as the table of old people piece together that the old man used to work with the grandfather of the owners of the restaurant. When I come back from the bathroom I find one of the women talking to Susan. She’s recommending a restaurant in Hancock, our destination for Day 4. As I walk by I can see her scalp through her wispy hair, and I’m filled suddenly with affection for her, for her aged frailty, for her interest in Susan, for the frailty of humanity, thankfulness for our clinging together. The son of the woman who owns the restaurant, maybe about fourteen years old, comes through the dining room wearing a baseball cap the way farmers do. He asks if we fish. He nods. Just before he leaves the room I ask if the fishing is good here. “Mostly carp and catfish,” he says matter-of-factly. Eating good is always good. Before meals, you can feel that your tank is empty. The miles come slower and harder, physically and mentally. After meals, the tires practically sing along the path. Thirty miles down, we think, re-crossing the river into Maryland. Thirty miles to go. The day does end. All days end. We always make it to the destination, no matter how long the ride. We pull into Hancock, built on a bit of flat ground pressed up against the river. But the motel is on high ground, a big hill off the end of main street on the way out of town. Exhausted, we push our bikes up the final climb. At the top: the American version of Tibetan paradise. The All-America Inn. A kitsch motel run by a gruff, kindly eastern European immigrant. We can barely understand the questions he barks at us, and back in our room we dub him Yuri. Laugh. Shower. Clean underwear and dry socks. Dinner at the restaurant that the woman in Paw Paw recommended. Frail humanity hanging together. Sleep. I apologize if this comment appears here times….login failures…. Larry and I did a sloggy ride west on that towpath many years ago. Flat is hard….why is that? Likely a life lesson in there. You have good deep thoughts, Joe. Jude–a great story, or at least precis of a story. We know your 2x great grandfather’s haunts intimately now!